Advances in technology and increased manufacturing scale have in any case reduced the cost, increased the reliability, and increased the efficiency of photovoltaic installations.Net metering and financial incentives, such as preferential feed-in tariffs for solar-generated electricity, have supported solar PV installations in many countries. More than 100 countries now use solar PV. Solar cells generate electricity directly from sunlight. Photovoltaic power potential map estimates, how much kWh of electricity can be produced from a 1 kWp free-standing c-Si modules, optimally inclined towards the Equator. The resulting long-term average (daily or yearly) is calculated based on the time-series weather data of at least recent 10 years. The map is published by the World Bank and provided by Solargis. Perovskite cells are also rapidly (as of 2019) progressing, with top efficiencies increasing from 13 % to 23,7 % for non stabilized cells and up to 28 % for perovskite/Si tandem monolithic cells between 2012 and 2018. Several market research and financial companies foresee record-breaking global installation of more than 50 GW in 2015. China is predicted to take the lead from Germany and to become the world's largest producer of PV power by installing another targeted 17.8 GW in 2015. India is expected to install 1.8 GW, doubling its annual installations. By 2018, worldwide photovoltaic capacity is projected to double or even triple to 430 GW. Solar Power Europe (formerly known as EPIA) also estimates that photovoltaics will meet 10% to 15% of Europe's energy demand in 2030. A traditional LCA can look at many different impact categories ranging from global warming potential, ecotoxicity, human toxicity, water depletion, and many others. Price per watt history for conventional (c-Si) solar cells since 1977. Photovoltaic power is also generated during a time of day that is close to peak demand (precedes it) in electricity systems with high use of air conditioning. Since large-scale PV operation requires back-up in the form of spinning reserves, its marginal cost of generation in the middle of the day is typically lowest, but not zero, when PV is generating electricity. This can be seen in Figure 1 of this paper: .More generally, it is now evident that, given a carbon price of $50/ton, which would raise the price of coal-fired power by 5c/kWh, solar PV will be cost-competitive in most locations. The declining price of PV has been reflected in rapidly growing installations, totaling about 23 GW in 2011. Although some consolidation is likely in 2012, due to support cuts in the large markets of Germany and Italy, strong growth seems likely to continue for the rest of the decade. Already, by one estimate, total investment in renewables for 2011 exceeded investment in carbon-based electricity generation. ^ a b c Lo Piano, Samuele; Mayumi, Kozo (2017). "Toward an integrated assessment of the performance of photovoltaic power stations for electricity generation". Applied Energy. 186 (2): 167–74. doi:10.1016/j.apenergy.2016.05.102. ^ Bushong, Steven (2016-05-09). "Advantages and disadvantages of a solar tracker system". Solar Power World. Retrieved 20 August 2016. ^ "Grid connect solar power FAQ - Energy Matters". ^ "Cloud Cover and Solar Radiation" (PDF). Scool.larc.nasa.gov. Retrieved 30 December 2017. ^ a b c d Bazilian, M.; Onyeji, I.; Liebreich, M.; MacGill, I.; Chase, J.; Shah, J.; Gielen, D.; Arent, D.; Landfear, D.; Zhengrong, S. (2013). "Re-considering the economics of photovoltaic power" (PDF). Renewable Energy. 53: 329–338. CiteSeerX 10.1.1.692.1880. doi:10.1016/j.renene.2012.11.029. ^ Palz, Wolfgang (2013). Solar Power for the World: What You Wanted to Know about Photovoltaics. CRC Press. pp. 131–. ISBN 978-981-4411-87-5. ^ Shubbak, Mahmood H. (2019). "The technological system of production and innovation: The case of photovoltaic technology in China". Research Policy. 48 (4): 993–1015. doi:10.1016/j.respol.2018.10.003. ^ Swanson, R. M. (2009). "Photovoltaics Power Up" (PDF). Science. 324 (5929): 891–2. doi:10.1126/science.1169616. PMID 19443773. ^ a b "Snapshot of Global Photovoltaic Markets 2017" (PDF). report. International Energy Agency. 19 April 2017. Retrieved 11 July 2017. ^ a b c "Snapshot of Global PV 1992–2014" (PDF). International Energy Agency — Photovoltaic Power Systems Programme. 30 March 2015. Archived from the original on 30 March 2015. ^ Photovoltaics Report. Fraunhofer Institute for Solar Energy Systems ISE. 7 November 2013. ^ Smee, Alfred (1849). Elements of electro-biology,: or the voltaic mechanism of man; of electro-pathology, especially of the nervous system; and of electro-therapeutics. London: Longman, Brown, Green, and Longmans. p. 15. ^ The photovoltaic effect Archived 12 October 2010 at the Wayback Machine. Encyclobeamia.solarbotics.net. Retrieved on 12 December 2010. ^ Jacobson, Mark Z. (2009). "Review of Solutions to Global Warming, Air Pollution, and Energy Security". Energy & Environmental Science. 2 (2): 148–173. CiteSeerX 10.1.1.180.4676. doi:10.1039/B809990C. ^ German PV market. Solarbuzz.com. Retrieved on 3 June 2012. ^ BP Solar to Expand Its Solar Cell Plants in Spain and India Archived 26 September 2007 at the Wayback Machine. Renewableenergyaccess.com. 23 March 2007. Retrieved on 3 June 2012. ^ Bullis, Kevin (23 June 2006). Large-Scale, Cheap Solar Electricity. Technologyreview.com. Retrieved on 3 June 2012. ^ Luque, Antonio & Hegedus, Steven (2003). Handbook of Photovoltaic Science and Engineering. John Wiley and Sons. ISBN 978-0-471-49196-5. ^ Massachusetts: a Good Solar Market Archived 12 September 2012 at the Wayback Machine. Remenergyco.com. Retrieved on 31 May 2013. ^ Vick, B.D., Clark, R.N. (2005). Effect of panel temperature on a Solar-PV AC water pumping system, pp. 159–164 in: Proceedings of the International Solar Energy Society (ISES) 2005 Solar Water Congress: Bringing water to the World, 8–12 August 2005, Orlando, Florida. ^ GE Invests, Delivers One of World's Largest Solar Power Plants. Huliq.com (12 April 2007). Retrieved on 3 June 2012. ^ Current Developments in Solar Technologies. cnn.com (17 December 2014). Retrieved on 1 April 2015. ^ Frank, Dimroth. "New world record for solar cell efficiency at 46% French-German cooperation confirms competitive advantage of European photovoltaic industry". Fraunhofer-Gesellschaft. Retrieved 14 March 2016. 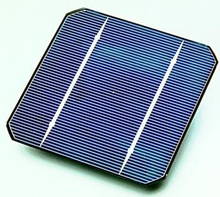 ^ Sharp Develops Solar Cell with World's Highest Conversion Efficiency of 35.8%. Physorg.com. 22 October 2009. Retrieved on 3 June 2012. ^ "SunPower TM X-Series Data Sheet" (PDF). SunPower. April 2013. Retrieved 25 October 2015. ^ Yu, J.; Zheng, Y.; Huang, J. (2014). "Towards High Performance Organic Photovoltaic Cells: A Review of Recent Development in Organic Photovoltaics". Polymers. 6 (9): 2473–2509. doi:10.3390/polym6092473. ^ Sun, Y.; Welch, G. C.; Leong, W. L.; Takacs, C. J.; Bazan, G. C.; Heeger, A. J. (2011). "Solution-processed small-molecule solar cells with 6.7% efficiency". Nature Materials. 11 (1): 44–8. Bibcode:2012NatMa..11...44S. doi:10.1038/nmat3160. PMID 22057387. ^ a b c Nancy M. Haegel (2017). "Terawatt-scale photovoltaics: Trajectories and challenges". Science. 356 (6334): 141–143. Bibcode:2017Sci...356..141H. doi:10.1126/science.aal1288. hdl:10945/57762. PMID 28408563. ^ "Renewables 2011: Global Status Report". REN21. 2011. p. 22. ^ "Global Market Outlook for Photovoltaics until 2016" (PDF). Epia.org. 2012. pp. 9, 11, 12, 64. Archived from the original (PDF) on 6 November 2014. ^ "Top Solar Power Industry Trends for 2015". IHS Technology. 15 January 2015. Retrieved 1 February 2015. ^ "SOLAR PV – GLOBAL GROWTH TO BE 25–30% DURING 2015". RenewableEnergyInvestments.com. 18 February 2015. ^ a b "Mercom Capital Group Forecasts Strong Year Ahead with Global Solar Installations of Approximately 54.5 GW". MercomCapital. March 2015. ^ Michael Liebreich (27 January 2015). "Liebreich: 10 Predictions For Clean Energy In 2015". Bloomberg New Energy Finance. Retrieved 1 February 2015. SOLAR SOLID WITH 55GW—Our prediction for solar in 2015 is that the world will add more than 55GW of capacity, and indeed, if the sector gathers steam during the year as we think it might, it could reach as much as 60GW, up from a record of just under 50GW last year. ^ "China's National Energy Administration: 17.8 GW Of New Solar PV In 2015 (~20% Increase)". CleanTechnica. 19 March 2015. ^ "Market Report 2013 (02)". EPIA-publications. European Photovoltaic Industry Association. March 2014. Archived from the original on 4 April 2014. ^ European Photovoltaic Industry Association (2013). "Global Market Outlook for Photovoltaics 2013–2017" (PDF). Archived from the original on 6 November 2014. ^ Solar Photovoltaic Electricity Empowering the World Archived 22 August 2012 at the Wayback Machine. Epia.org (22 September 2012). Retrieved on 31 May 2013. ^ Liebreich, Michael (29 January 2014). "A YEAR OF CRACKING ICE: 10 PREDICTIONS FOR 2014". Bloomberg New Energy Finance. Retrieved 24 April 2014. ^ Barclays stuft Anleihen von US-Stromversorgern herunter; Konkurrenz durch Photovoltaik und Energiespeicher Archived 15 July 2014 at the Wayback Machine. In: solarserver.de, 16. Juni 2014. Abgerufen am 16. Juni 2014. ^ a b "Snapshot of Global Photovoltaic Markets" (PDF). report. International Energy Agency. 22 April 2016. Retrieved 24 May 2016. ^ "Are we headed for a solar waste crisis?". Environmentalprogress.org. Retrieved 30 December 2017. ^ a b Life Cycle Greenhouse Gas Emissions from Solar Photovoltaics, National Renewable Energy Laboratory, U.S. Department of Energy, 2012, 1–2. ^ a b Krebs, F. C. (2009). "Fabrication and processing of polymer solar cells: a review of printing and coating techniques". Solar Energy Materials and Solar Cells. 93 (4): 394–412. doi:10.1016/j.solmat.2008.10.004. ^ Gaidajis, G. & Angelakoglou, K. (2012). "Environmental performance of renewable energy systems with the application of life-cycle assessment: a multi-Si photovoltaic module case study". Civil Engineering and Environmental Systems. 29 (4): 231–238. doi:10.1080/10286608.2012.710608. ^ Photovoltaics Report. (Fraunhofer Institute for Solar Energy Systems, ISE, 2015). ^ a b Goe, M. & Gaustad, G. (2014). "Strengthening the case for recycling photovoltaics: An energy payback analysis". Applied Energy. 120: 41–48. doi:10.1016/j.apenergy.2014.01.036. ^ Werner, Jürgen H.; Zapf-Gottwick, R.; Koch, M.; Fischer, K. (2011). Toxic substances in photovoltaic modules. Proceedings of the 21st International Photovoltaic Science and Engineering Conference. 28. Fukuoka, Japan. ^ Brown, G. F. & Wu, J. (2009). "Third generation photovoltaics". Laser & Photonics Reviews. 3 (4): 394–405. Bibcode:2009LPRv....3..394B. doi:10.1002/lpor.200810039. ^ a b c Celik, Ilke; Song, Zhaoning; Cimaroli, Alexander J.; Yan, Yanfa; Heben, Michael J.; Apul, Defne (2016). "Life Cycle Assessment (LCA) of perovskite PV cells projected from lab to fab". Solar Energy Materials and Solar Cells. 156: 157–69. doi:10.1016/j.solmat.2016.04.037. ^ a b Celik, I., Mason, B. E., Phillips, A. B., Heben, M. J., & Apul, D. S. (2017). Environmental Impacts from Photovoltaic Solar Cells Made with Single Walled Carbon Nanotubes. Environmental Science & Technology. ^ Agboola, A. E. Development and model formulation of scalable carbon nanotube processes: HiPCO and CoMoCAT process models;Louisiana State University, 2005. ^ Alharbi, Fahhad; Bass, John D.; Salhi, Abdelmajid; Alyamani, Ahmed; Kim, Ho-Cheol; Miller, Robert D. (2011). "Abundant non-toxic materials for thin film solar cells: Alternative to conventional materials". Renewable Energy. 36 (10): 2753–2758. doi:10.1016/j.renene.2011.03.010. ^ Dos Reis Benatto, Gisele A.; Roth, Bérenger; Madsen, Morten V.; Hösel, Markus; Søndergaard, Roar R.; Jørgensen, Mikkel; Krebs, Frederik C. (2014). "Carbon: The Ultimate Electrode Choice for Widely Distributed Polymer Solar Cells". Advanced Energy Materials. 4 (15): n/a. doi:10.1002/aenm.201400732. ^ Lattante, Sandro (2014). "Electron and Hole Transport Layers: Their Use in Inverted Bulk Heterojunction Polymer Solar Cells". Electronics. 3: 132–164. doi:10.3390/electronics3010132. ^ a b Krebs, Frederik C.; Jørgensen, Mikkel (2013). "Polymer and organic solar cells viewed as thin film technologies: What it will take for them to become a success outside academia". Solar Energy Materials and Solar Cells. 119: 73–76. doi:10.1016/j.solmat.2013.05.032. ^ Espinosa, Nieves; García-Valverde, Rafael; Urbina, Antonio; Krebs, Frederik C. (2011). "A life cycle analysis of polymer solar cell modules prepared using roll-to-roll methods under ambient conditions". Solar Energy Materials and Solar Cells. 95 (5): 1293–1302. doi:10.1016/j.solmat.2010.08.020. ^ Espinosa, Nieves; Lenzmann, Frank O.; Ryley, Stephen; Angmo, Dechan; Hösel, Markus; Søndergaard, Roar R.; Huss, Dennis; Dafinger, Simone; Gritsch, Stefan; Kroon, Jan M.; Jørgensen, Mikkel; Krebs, Frederik C. (2013). "OPV for mobile applications: An evaluation of roll-to-roll processed indium and silver free polymer solar cells through analysis of life cycle, cost and layer quality using inline optical and functional inspection tools". Journal of Materials Chemistry A. 1 (24): 7037. doi:10.1039/C3TA01611K. ^ García-Valverde, R.; Miguel, C.; Martínez-Béjar, R.; Urbina, A. (2009). "Life cycle assessment study of a 4.2k Wp stand-alone photovoltaic system". Solar Energy. 83 (9): 1434–1445. Bibcode:2009SoEn...83.1434G. doi:10.1016/j.solener.2009.03.012. ^ "Insolation Levels (Europe)". Apricus Solar. Archived from the original on 17 April 2012. Retrieved 14 April 2012. ^ "UD-led team sets solar cell record, joins DuPont on $100 million project". UDaily. University of Delaware. 24 July 2007. Retrieved 24 July 2007. ^ Schultz, O.; Mette, A.; Preu, R.; Glunz, S.W. "Silicon Solar Cells with Screen-Printed Front Side Metallization Exceeding 19% Efficiency". The compiled state-of-the-art of PV solar technology and deployment. 22nd European Photovoltaic Solar Energy Conference, EU PVSEC 2007. Proceedings of the international conference. CD-ROM : Held in Milan, Italy, 3 – 7 September 2007. pp. 980–983. ISBN 978-3-936338-22-5. ^ Shahan, Zachary. (20 June 2011) Sunpower Panels Awarded Guinness World Record. Reuters.com. Retrieved on 31 May 2013. ^ a b "Sunny Uplands: Alternative energy will no longer be alternative". The Economist. 21 November 2012. Retrieved 28 December 2012. ^ Wells, Ken (25 October 2012). "Solar Energy Is Ready. The U.S. Isn't". Bloomberg Businessweek. Retrieved 1 November 2012. ^ Utilities’ Honest Assessment of Solar in the Electricity Supply. Greentechmedia.com (7 May 2012). Retrieved on 31 May 2013. ^ Renewable energy costs drop in '09 Reuters, 23 November 2009. ^ Solar Power 50% Cheaper By Year End – Analysis. Reuters, 24 November 2009. ^ Harris, Arno (31 August 2011). "A Silver Lining in Declining Solar Prices". Renewable Energy World. ^ a b Quiggin, John (3 January 2012). "The End of the Nuclear Renaissance". National Interest. ^ Solar PV Module Costs to Fall to 36 Cents per Watt by 2017. Greentechmedia.com (2013-06-18). Retrieved on 2015-04-15. ^ Alafita, T.; Pearce, J. M. (2014). "Securitization of residential solar photovoltaic assets: Costs, risks and uncertainty". Energy Policy. 67: 488–498. doi:10.1016/j.enpol.2013.12.045. ^ Matar, Walid; Anwer, Murad (2017). "Jointly reforming the prices of industrial fuels and residential electricity in Saudi Arabia". Energy Policy. 109: 747–756. doi:10.1016/j.enpol.2017.07.060. ^ Converting Solar Energy into the PHEV Battery Archived 22 February 2014 at the Wayback Machine. VerdeL3C.com (May 2009). ^ Platzer, Michael (January 27, 2015). "U.S. Solar Photovoltaic Manufacturing: Industry Trends, Global Competition, Federal Support". Congressional Research Service. ^ "How PV Cells Are Made". www.fsec.ucf.edu. Retrieved 2015-11-05. ^ "Solar PV Modules". www.targray.com. Retrieved 2018-10-03. ^ "Thin Film Photovoltaics". www.fsec.ucf.edu. Retrieved 2015-11-05. ^ Secor, Ethan. "Emerging Photovoltaic Technologies." MSE 381 Lecture. Evanston. 3 Nov. 2015. Lecture. 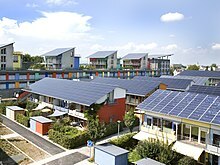 ^ "Solar panels keep buildings cool". University of California, San Diego. Retrieved 19 May 2015. ^ "Global Market Outlook for Photovoltaics 2014–2018" (PDF). EPIA – European Photovoltaic Industry Association. p. 45. Archived from the original (PDF) on 12 June 2014. Retrieved 19 May 2015. ^ Mojiri, A.; Taylor, R.; Thomsen, E.; Rosengarten, G. (2013). "Spectral beam splitting for efficient conversion of solar energy—A review". Renewable and Sustainable Energy Reviews. 28: 654–663. doi:10.1016/j.rser.2013.08.026. ^ Pathak, M. J. M.; Sanders, P. G.; Pearce, J. M. (2014). "Optimizing limited solar roof access by exergy analysis of solar thermal, photovoltaic, and hybrid photovoltaic thermal systems". Applied Energy. 120: 115–124. CiteSeerX 10.1.1.1028.406. doi:10.1016/j.apenergy.2014.01.041. ^ Solar loans light up rural India. BBC News (29 April 2007). Retrieved on 3 June 2012. ^ Off grid solutions for remote poor. ebono.org. (26 February 2008). ^ Barclay, Eliza (31 July 2003). Rural Cuba Basks in the Sun. islamonline.net. ^ King, Debbie L.; Babasola, Adegboyega; Rozario, Joseph; Pearce, Joshua M. (2014). "Mobile Open-Source Solar-Powered 3-D Printers for Distributed Manufacturing in Off-Grid Communities". Challenges in Sustainability. 2. doi:10.12924/cis2014.02010018. ^ Erickson, Jon D.; Chapman, Duane (1995). "Photovoltaic Technology: Markets, Economics, and Development". World Development. 23 (7): 1129–1141. doi:10.1016/0305-750x(95)00033-9. ^ "Solar water pumping". builditsolar.com. Retrieved 16 June 2010. ^ Solar-Powered Parking Meters Installed. 10news.com (18 February 2009). Retrieved on 3 June 2012. ^ "Solar-powered parking meters make downtown debut". Impactnews.com. 22 July 2009. Retrieved 19 September 2011. ^ Philadelphia's Solar-Powered Trash Compactors. MSNBC (24 July 2009). Retrieved on 3 June 2012. ^ Winery goes solar with 'Floatovoltaics'. SFGate (29 May 2008). Retrieved on 31 May 2013. ^ Napa Winery Pioneers Solar Floatovoltaics. Forbes (18 April 2012). Retrieved on 31 May 2013. 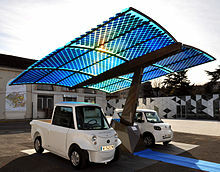 ^ Miller, Ross (13 January 2009) Next-gen Prius now official, uses solar panels to keep car cool. engadget.com. ^ "World's largest solar-powered boat completes its trip around the world". Gizmag.com. Retrieved 30 December 2017. ^ Solar-powered plane lands outside Washington D.C. Nydailynews.com (2013-06-17). Retrieved on 2015-04-15. ^ SolidWorks Plays Key Role in Cambridge Eco Race Effort. cambridgenetwork.co.uk (4 February 2009). ^ Perlin, John (2005). "Late 1950s – Saved by the Space Race". SOLAR EVOLUTION – The History of Solar Energy. The Rahus Institute. Retrieved 25 February 2007. ^ Takeno, Tadao; Sato, Kenji; Hase, Köji (1981). "A theoretical study on an excess enthalpy flame". Symposium (International) on Combustion. 18 (1): 465–72. doi:10.1016/S0082-0784(81)80052-5. ^ a b Smil, Vaclav (2006) Energy at the Crossroads. oecd.org. Retrieved on 3 June 2012. ^ "Study: Air pollution causes 200,000 early deaths each year in the U.S". News.mit.edu. Retrieved 30 December 2017. ^ "The US could prevent a lot of deaths by switching from coal to solar". USA TODAY. Retrieved 30 December 2017. ^ McDonald, N.C.; Pearce, J.M. (2010). "Producer Responsibility and Recycling Solar Photovoltaic Modules". Energy Policy. 38 (11): 7041–7047. doi:10.1016/j.enpol.2010.07.023. ^ Advantages and disadvantages of solar energy Archived 26 December 2013 at the Wayback Machine. Retrieved on 25 December 2013. ^ U.S. Climate Change Technology Program – Transmission and Distribution Technologies Archived 27 September 2007 at the Wayback Machine. (PDF) . Retrieved on 3 June 2012. ^ Fraunhofer: 41.1% efficiency multi-junction solar cells. renewableenergyfocus.com (28 January 2009). ^ Study Sees Solar Cost-Competitive In Europe By 2015. Solar Cells Info (16 October 2007). Retrieved on 3 June 2012. ^ "Berkeley FIRST Solar Financing – City of Berkeley, CA". cityofberkeley.info. ^ DSIRE Solar Portal. Dsireusa.org (4 April 2011). Retrieved on 3 June 2012. ^ Hoen, Ben; Wiser, Ryan; Cappers, Peter & Thayer, Mark (April 2011). "An Analysis of the Effects of Residential Photovoltaic Energy Systems on Home Sales Prices in California" (PDF). Berkeley National Laboratory. ^ Miller, Wendy; Liu, Lei Aaron; Amin, Zakaria; Gray, Matthew (2018). "Involving occupants in net-zero-energy solar housing retrofits: An Australian sub-tropical case study". Solar Energy. 159: 390–404. Bibcode:2018SoEn..159..390M. doi:10.1016/j.solener.2017.10.008.